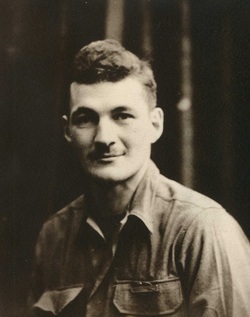 George Miller was in the First infantry Division, known as The Big Red One. When duty called, he went overseas aboard the Queen Mary, which had been converted into a troop carrier affectionately called, "The Grey Ghost." George was part of the campaigns in North Africa and Sicily and was in the first wave to storm Omaha Beach on D-Day. He was wounded during the Battle of the Bulge, for which he received the Purple Heart. The treatment for these wounds would eventually bring him back to the States, where he would meet an Army Nurse, Neoma Yoho, whom he would marry and make a home together in Lakewood for 47 years. George rarely, if ever, spoke of his wartime experiences. His letters home to family would tell of the relentless heat in North Africa and the constant blowing sand. He would also write of the warmth and kindness of the British family who welcomed him for Sunday dinners while he was stationed temporarily in England, and of having to spend a second Christmas huddled in a foxhole. He never spoke of the horror or the glory of war. He kept his memories close in his heart and let history tell the stories. Upon his passing, his family found, tucked inside his wallet, the letter from General Eisenhower given to the troops on D-Day. The letter was worn and tattered and he had clearly carried this with him every day since 1944. Part of the letter reads, "The hopes and prayers of liberty loving people everywhere march with you." The liberty and freedom we enjoy today is because of my Dad and all of the other men and women of his generation's service to their country . His service, and theirs, means we can live, work and raise our families in Lakewood safe in the knowledge our freedom is secure. George Miller was one of the original Lakewood homeowners, buying the newly built home on Schroll Street in the Carson Park section in 1952. This house would remain his home for the next 47 years, until his passing in 1999. After moving to Lakewood, he began working at Douglas Aircraft Co. in Long Beach. He retired from McDonnell Douglas after 27 years of service and in retirement remained active in the local chapter of the VFW.